BEL ESPRIT (AUS) (Bay 1999-Stud 2003). 8 wins-5 at 2, BTC Doomben Ten Thousand S., Gr.1. Leading Aust. Sire of Winners 2012-13. Sire of 954 rnrs, 644 wnrs, 24 SW, inc. Black Caviar (ATC TJ Smith S., Gr.1), Bel Sprinter, Bel Mer, Keen Array, Sweet Sherry, Afleet Esprit, Se Sauver, Gabbidon, Vivacious Spirit, Lady Esprit, Iconic, Angels Beach, City of Song, Honey Flower, Loveyamadly, Audacious Spirit, Oregon Spirit, Strike the Tiger, Peach Tree, etc. Zaaresque. Winner at 1400m in 2016-17, 2d MVRC Fisher & Paykel P.
Wildcat Strike (f. by Hold That Tiger). 3 wins to 1400m, 2d MRC Bint Marscay 2YO H.
Rowdy Belle (f. by Bel Esprit). 2 wins-1 at 2-at 1100m, 1300m, 2d MRC Jim Conway 2YO H.
Whisper (g. by Dracula). 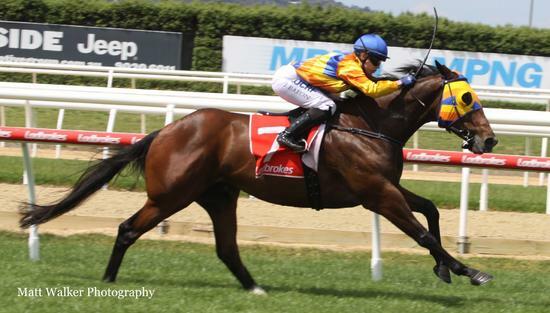 2 wins at 1400m, 1600m in Aust. Doctor Hush (g. by Hold That Tiger). Winner at 1500m in Aust. All Spirit (f. by Bel Esprit). Winner at 1000m in Aust. Olympic Lad (g. by Bel Esprit). See below. Louisville Lass. Winner at 1600m in Aust. Sound. 9 wins from 1550m to 3050m, A$165,603, VATC Slixpix P.H., SAJC Blackfriars H., AJC Sebel of Sydney H., SAJC Robot Printing H., STC Penrith H., Boasting H., 2d AJC Alexander MacKellar H., STC Girls Day Out Welter H., 3d Oakbank RC Yalumba Classic Hurdle, STC Horizon at Mission Beach H., Spice Girls Tribute H., Young Brolga H.
Recruits. 2 wins at 1900m, STC Australian Bloodstock Agency H., Dundas Valley Rugby Golden Oldies H., 2d STC Members Reserved Seating H., Peter A Lawson Memorial H., Tooheys Illawarra Cup, 3d STC Young Members Cruise H., 4th City Tattersall's Club Cup, L.
Perlia Bay (Kingdom Bay). 5 wins-1 at 2-from 1100m to 2100m, Waikato RC BMW Corporate Dinner H., Hawkes Bay Paris Opera Graduation H., 2d ARC Auckland Classic, Gr.1, Soliloquy S., L, Cambridge Stud Mile H., DB Draught H. Producer. Kim Hostess (Kingdom Bay). Winner at 2, WATC Hocking 2YO H., 2d WATC Cambana Lad 2YO H., Craig Evans 2YO H., Fortescue H., 3d WATC Queen's P., L, 4th WATC Supremacy S., L. Producer. RESONARE (Centaine). 6 wins from 1200m to 1600m, NZ$88,675, WRC Thompson H., Gr.3, Marton JC Rangitikei Tavern H., Manawatu RC Malcolm Smith Memorial H., Marton JC Southern Rangitikei Veterinary Services H., 3d ARC Easter H., Gr.1, Manawatu RC DB Draught 1600 H., L, 4th Hawkes Bay Mudgway Partsworld S., Gr.2. Race Record: 9 Starts 0-1-1 A$21,840.